I'm a big fan of David Hockney. I think he hits home the Cubist movement in a new way for the children. 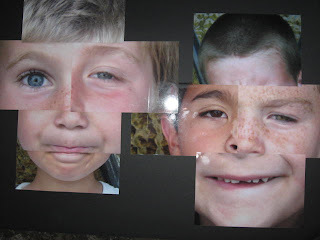 Originally I thought I'd introduce my 1st and 2nd graders to him by taking 5 close up shots of their facial features (forehead, left and right eyes, nose and mouth) and asking them to put them together to form a cubist version of themselves. 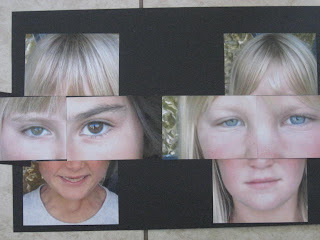 But when I started playing around with the double copies I ordered, I created a compilation of the features of the children in my class - and created a new mutated child. I howled with laughter. What 6-8 year old wouldn't get a kick out of this? 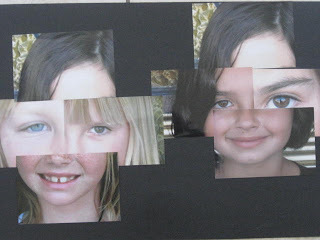 So we played a game to mix up the facial features and everyone got 5 different pictures to create their new mixed up kid. They assembled these 2 compilations side by side. This has been a hugely popular project and one that is often requested.